Activate the bundled rekordbox dj licence key to experiment with different DJ styles and discover your favourite. You can perform with music stored on USB drives, access your library through Link Export or use Performance mode via your laptop – the choice is yours. The 7-inch colour screen enables you to keep an eye on your beats as you put your own spin on tracks using dedicated Beat FX and Sound Color FX. Equipped with everything you need to create unique mixes on the fly, you’ll be filling dancefloors in no time. 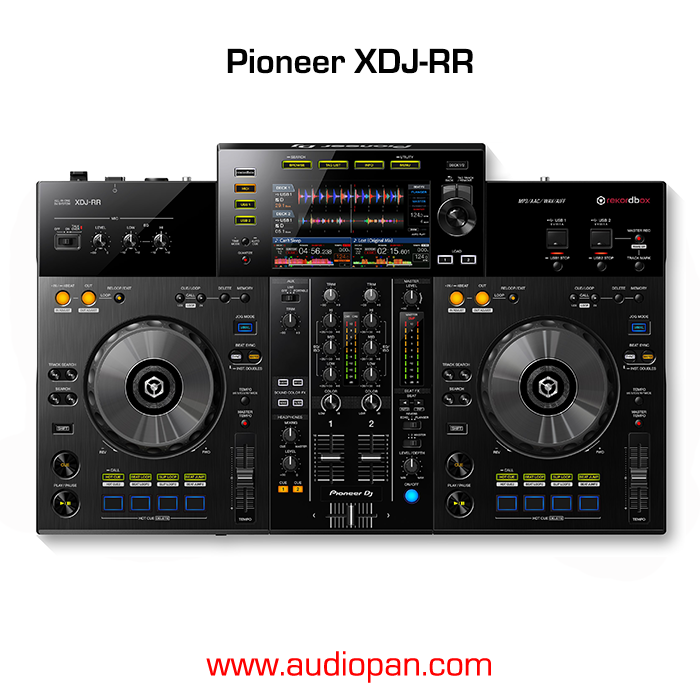 The XDJ-RR lets you choose how you’d like to perform. You can plug in your USB drive and play tracks directly, use Link Export mode to access your entire rekordbox library via your laptop without needing to export your music to a USB drive, or, if you’d prefer, you can connect your PC/Mac with a single USB cable to harness Performance mode in rekordbox dj. It’s all up to you. See what’s happening on both players simultaneously via the 7-inch colour screen. Keep an eye on the playback status, BPM, waveform, and other information vital to performing creative, smooth sets. Deliver fine-tuned mixes with the help of EQs and channel faders which feature the same curves as those on our professional club mixer, the DJM-900NXS2. You can also customise your routines with the popular Beat FX – Echo, Reverb and Flanger – and dial up the texture and tension with Sound Color FX – Filter, Noise, Dub Echo and Pitch. The XDJ-RR comes bundled with our professional performance application, rekordbox dj, so you can simply activate your licence key and power up to start DJing straight out of the box. Unlock even more features by combining the XDJ-RR with our DDJ-XP1 sub controller (available separately) and the crowd won’t know what hit them. Weighing in at just 5.2kg, transporting your kit to practice sessions, house parties and gigs is a breeze. Connect 2 USB drives at the same time for seamless DJ transitions, back-to-back performances or as a reserve, just in case. Record your mix directly to a USB drive and load it into your rekordbox library for easy editing. Plug in an AUX cable to play music from your mobile phone or other devices.